To Cite: Salimi F, Eftekhar F. Coexistence of AmpC and Extended-Spectrum β-lactamases in Metallo-β-Lactamase Producing Pseudomonas aeruginosa Burn Isolates in Tehran, Jundishapur J Microbiol. 2013 ; 6(8):e7178. doi: 10.5812/jjm.7178. Background: Multi-drug resistant Pseudomonas aeruginosa causes serious complications in burn patients. One of the most important mechanisms of resistance to β-lactam antibiotics is hydrolysis of antibiotics by various β-lactamases. In recent years, Carbapenems have been widely used for treatment of P. aeruginosa infections. However, the organisms have become resistant to Carbapenems mostly by producing metallo β-lactamases. Objectives: The aim of this study was to determine antibiotic susceptibility, production of extended spectrum and AmpC β-lactamases in metallo β-lactamase producing P. aeruginosa burn isolates. Materials and Methods: Antibiotic susceptibility of 135 P. aeruginosa burn isolates was determined by disc diffusion. Metallo β-lactamase production was screened by the double disc synergy test. Metallo β-lactamase producing bacteria were then tested for extended spectrum β-lactamase production by the combined disc diffusion method. AmpC production was carried out using AmpC disc test. Results: There was 99% resistance to Carbenicillin, and Ticarcillin, 98% to Cotrimoxazole, 96% to Ciprofloxacin, and Aztreonam, 95% to Imipenem, and Meropenem, 94% to Pperacillin, 93% to Tobramycin, 92% to Cefepime, 90% to Amikacin, 89% to Ceftazidime, and 87% to Piperacillin-tazobactam. Among the 128 Imipenem resistant isolates, 32 (25%) were capable of producing metallo β-lactamases of which, 4 (12.5%) produced extended spectrum and 26 (81%) produced AmpC β-lactamases. Four isolates (12.5%) produced all 3 types. Conclusions: This study showed that multiple β-lactamases can be produced in burn isolates. This suggests that use of Cephalosporins and Carbapenems should be restricted in burn isolates to minimize the development and spread of these multidrug resistant pathogens. Pseudomonas aeruginosa is an opportunistic pathogen which frequently causes infections in burned patients and is generally resistant to various antimicrobial agents (1, 2). Resistance to β-lactam antibiotics is associated with production of extended-spectrum β-lactamases (ESBL) which can hydrolyze oxyimino β-lactams such as Cefotaxime, Ceftriaxone, Ceftazidime and Monobactams, however, have no effect on Cephamycins, Carbapenems and related compounds (2). In the 1980s, Carbapenems were introduced which provided a novel therapeutic option for treatment of serious Gram-negative infections as they were resistant to most β-lactamases and had a suitable rate of permeation through the bacterial outer membranes. However, Carbapenem resistant bacteria emerged shortly after (3). Common forms of resistance to Carbapenems in P. aeruginosa are low permeability through the outer membrane, reduced levels of drug accumulation due to active efflux systems and production of enzymes such as Carbapenemases or AmpC β-lactamases (3-5). Carbapenemases are classified into two main molecular families, those with serine at their active site, known as serine Carbapanemases and those with at least one zinc atom at their active site, known as metallo β-lactamases (MBLs) (6, 7). MBLs are capable of hydrolyzing all β-lactam antibiotics except for Aztreonam and are not blocked with β-lactamase inhibitors such as Clavulanate, Sulbactam and Tazonactam (1, 8). Six distinct types of MBLs are known in P. aeruginosa including IMP, VIM, SPM, GIM, AIM, and SIM (8-12). MBL encoding genes are usually carried by mobile genetic structures such as plasmids, Transposons or Integrons with great ability to spread (13). Hence, early detection of MBL producing organisms is crucial to establish appropriate antimicrobial therapy, and to prevent their inter and intra hospital dissemination (14). AmpC β-lactamases encoded by both chromosomal and plasmid genes can effectively hydrolyze Penicillins and Cephalosporins including broad-spectrum Cephalosporins. Whereas resistance to most β-lactams emerges as a result of AmpC overproduction, a definitive relationship between P. aeruginosa AmpC and Carbapenem susceptibility remains unclear. However, it has been suggested that AmpC overproduction alone does not significantly alter the susceptibility of P. aeruginosa to Carbapenems, but could contribute to resistance if accompanied with additional resistance mechanisms (e.g. efflux pump overproduction, decreased OprD, and/or production of class A/class B carbapenemase) (15). The aim of this study was to determine the antibiotic susceptibility of P. aeruginosa burn isolates, prevalence of MBL production as well as production of extended-spectrum and AmpC β-lactamases among MBL producing isolates. A total of 135 P. aeruginosa isolates (94 from males and 41 from females) were isolated from patients admitted to Shahid Motahari hospital, a level 1 burn care center in Tehran from July to November 2011. Organisms were identified using standard biochemical tests such as Gram staining, ability to produce oxidase, oxidation of glucose, pigment formation, growth at 42°C, acid and gas production on triple sugar iron agar (BBL, USA) in Microbiology Laboratory at Shahid Beheshti University. Antibiotic susceptibility of the isolates was determined by disc diffusion according to CLSI recommendations (16). Antibiotics (Mast, England) were: Ceftazidime (30 μg), Aztreonam (30 μg), Carbenicillin 100 μg), Piperacillin (100 μg), Ticarcillin (75 μg), Cotrimoxazole (25 μg), Amikacin (30 μg), Cefepime (30 μg), Ciprofloxacin (5 μg), Tobramycin (10 μg), Meropenem (10 μg), Imipenem (10 μg) and Piperacillin/tazobactam (110 μg). P. aeruginosa ATCC27853 was used as the susceptible reference strain. All isolates were screened for MBL production by the double disc synergy test (DDST) (17). Briefly, bacterial cultures were grown at 37°C in Muller Hinton broth (Liofilchem, Italy) and the turbidity was adjusted to 0.5 McFarland standard before inoculating the surface of Muller Hinton agar (Liofilchem, Italy) plates. A 10 µg Imipenem disc and a sterile blank disc (6.4mm, Padtan Teb, Iran) were placed 15 mm apart (center to center) and 10 µl of a 0.5 M EDTA solution (pH, 8.0) (Sinaclon, Iran) was added to the blank disc before incubating the plates overnight at 37°C. Presence of extended growth inhibition zone between the two discs was interpreted as positive for MBL production. ESBL production was screened by the phenotypic confirmatory test (18). Discs containing Ceftazidime (30 µg) alone and in combination with Clavulanic acid (10 µg) were placed on bacterial lawns before incubation at 37°C overnight. An increase of 5 mm in the inhibition zone around the combination disc was considered as ESBL production. Metallo β-lactamase producing isolates were screened for AmpC β-lactamase production by the AmpC disc test (19). Briefly, a moistened blank disc with sterile saline was inoculated with a few colonies of the test strain. The disc was then placed next to a 30 μg Cefoxitin disc on the surface of a Muller Hinton agar plate previously inoculated with a lawn of Escherichia coli ATCC 25922. The plate was incubated overnight at 37°C. An indentation of Cefoxitin inhibition zone adjacent to the disc containing the test strain, indicated AmpC β-lactamase production. 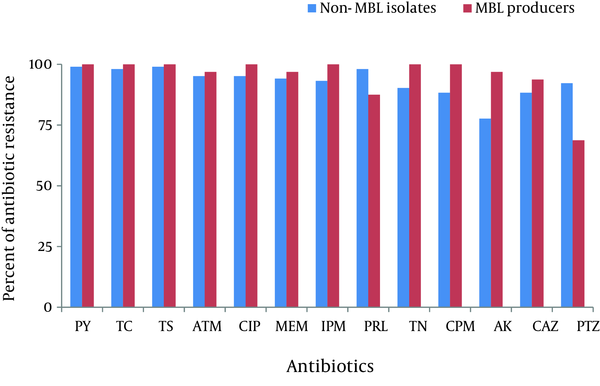 Antibiotic resistance profiles of MBL and non-MBL producing isolates were compared using non-parametric analysis. Two-tailed Mann-Whitney test was performed for continuous variables, independent groups and non-normal distribution using SPSS 19. Majority of the isolates were from wound infections (90%) followed by subclavian catheters (cvp) (5%), blood (3%), soft tissues (1%) and urine (1%). Figure 1 shows the antibiotic resistance profile of 103 non-MBL and 32 MBL isolates. Resistance rates of all isolates were: 99% to Carbenicillin and Ticarcillin, 98% to Cotrimoxazole, 96% to Ciprofloxacin and Aztreonam, 95% to Imipenem and Meropenem, 94% to Piperacillin, 93% to Tobramycin, 92% to Cefepime, 90% to Amikacin, 89% to Ceftazidime and 87% to Piperacillin/tazobactam. All isolates were multidrug resistant (MDR). Overall, the highest resistance rate was observed for Carbenicillin and Ticarcillin and the lowest for Piperacillin/tazobactam. Of the 135 P. aeruginosa isolates, 32 (25%) were MBL producers. Antibiotic susceptibility pattern of MBL positive isolates showed 100% resistance to Carbenicillin, Ticarcillin, Cotrimoxazole, Imipenem, Tobramycin, Cefepime and Ciprofloxacin, 96.87% to Aztreonam, Amikacin and Meropenem, 93.76% to Ceftazidime, 84.37 % to Peracillin and 68.75% to Piperacillin/tazobactam (Table 1). For MBL producers, the highest rate of resistance was observed for Carbenicillin, Cotrimoxazole, Tobramycin, Ciprofloxacin, Cefepime and the lowest rate for Piperacillin/tazobactam. Among MBL producers, 4 isolates (12.5%) produced ESBLs and 26 (81%) produced AmpC β-lactamases. Coexistence of ESBL and AmpC β-lactamase was observed in 4 MBL producing isolates (12.5%). cResistance to Piperacillin-tazobactam and Piperacillin are significantly different between MBL and non-MBL producers. bSignificance level was determined using the two-tailed Mann-Whitney test. P ≤ 0.01 shows significance at 99% confidence interval and P > 0.1 at 90% confidence interval, respectively. Antibiotic resistance profiles of MBL and non-MBL producing isolates were similar except for Piperacillin/tazobactam (P < 0.01 at 99% confidence interval) and Piperacillin (P < 0.1 at 90% confidence interval), where the MBL producers were significantly more susceptible than MBL negative isolates. Of the 32 MBL positive isolates, 10 (31.25%) were susceptible to Piperacillin/tazobactam, five of which were also susceptible to Piperacillin. All Piperacillin/tazobactam and Piperacillin susceptible strains also produced AmpC β-lactamase, except for 1 Piperacillin/tazobactam susceptible isolate. In the past decade, multi-drug resistant P. aeruginosa, in particular, strains showing multiple resistance to β-lactam antibiotics, have become an increasing public health problem. Among these, MBL producing strains have been reported to be responsible for serious nosocomial infections worldwide (1, 3, 10, 12, 20). Prevalence of MBL production among Imipenem resistant P. aeruginosa burn isolates has been reported within the range of 20-94% in Iran (21-24). The wide range of resistance is dependent upon the hospital setting, extensive use of antibiotics as well as dissemination of resistance genes among these bacterial pathogens. We found that the majority of the isolates were multi-drug resistant and 25% of the Imipenem resistant isolates were MBL producers. MBLs are reported to be resistant to all β-lactam antibiotics except for Monobactams such as Aztreonam (9, 19). In this study, 96.87% of the isolates were resistant to aztreonam, suggesting coexistence of other resistance mechanisms such as AmpC type β-lactamases or MexAB-OprM Efflux Pumps (25-27). The same finding was reported by Shahcheraghi et al. where all metallo β-lactamase producing isolates were resistant to Aztreonam ( 28 ). Such mechanisms seem to be also responsible for β-lactam resistance in non-MBL isolates. Comparison of antibiotic susceptibility between non-MBL and MBL producing isolates showed similar antibiotic resistance profiles except for Piperacillin/tazobactam, where the MBL producers were significantly more susceptible than MBL-negative isolates (P < 0.01). The same results have been reported by other investigators ( 12 , 21 , 28 ). Overall, Piperacillin/tazobactam was the most effective drug against MBL producing organisms (Table 1). In the present study, AmpC production was observed in 26 isolates (81%) and ESBL production was observed in 4 (12.5%) MBL producers. Production of both AmpC and ESBL was observed in 4 MBL producers (12.5%). Noyal et al. showed that 46.9% of the Meropenem resistant P. aeruginosa also produced AmpC β-lactamase (19). Upadhyay showed coexistence of AmpC and MBL in 46.6% and ESBL production in 3.3% of their P. aeruginosa isolates (29). AmpC β-lactamase production which is not inhibited by Clavulanic acid, may cause false ESBL production results. Increasing occurrence of multiple β-lactamases in these clinical isolates could lead to therapeutic failure. Hence, early detection of β-lactamase production can benefit implementation of proper antibiotic therapy and infection control policies. The authors wish to thank Shahid Beheshti University Research Council for providing a special grant to finance this research. Implication for health policy/practice/research/medical education: The study suggests that early detection of β-lactamase production in multi-resistant P. aeruginosa can help implementation of proper antibiotic therapy, avoid spread of resistance determinants among bacteria and choice of infection control policies. Funding/Support: This research was support by Shahid Beheshti University Research Council.